How to buy, sell & rent! More than 100 quick and easy TIPS on buying, selling, renting and exchanging your timeshare. As seen on cable TV, these tapes were created from the original A.D. Kessler's Real Estate Roundtable interviews with Mario Collura and Viccie Mac, the foremost industry leaders in Timeshare Resales and Rentals. Timeshare Video TIPS are required viewing for all first-time buyers and sellers. They also provide a helpful reminder checklist for the seasoned veteran. 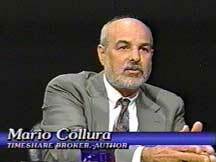 Mario Collura, author of Mario's TIPS is frequently quoted in national media including: Business Week, Dollar $ense, Consumer Digest, Coastal Living, Forbes,Kiplinger's Personal Finance Magazine and USA Today. 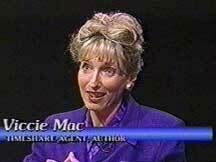 Viccie Mac, Managing Editor of the Timeshare Directory and author of Viccie's Timeshare Rental TIPS developed and implemented the first national, owner based, timeshare rental program. Mac was most recently quoted in an article titled, "Your Dream Vacation, Save More, Spend Less" in Family Circle Magazine. We're sorry, but the video tapes are currently unavailable.